Christmas is my favorite-always has been, always will be. Christmas cards are part of why it’s my favorite. My family is huge, I’m one of six kids and my hubby’s one of seven kids, so between us we have 33 nieces and nephews with another one on the way. Really, I wasn’t lying, my family is enormous. While I love keeping up with all of the littles in my family on social media, nothing can replace that tangible photo of the kids on my fridge. I love Christmas cards because they usually come with a new photo of my nieces and nephews, so I always include a photo of my kids on our Christmas card. Usually I’m a plan ahead kind of gal when it comes to Christmas. Presents are usually planned and purchased in July or August, Christmas cards ordered in the beginning of November, and the tree put up the day after Thanksgiving. I would put the tree up sooner, but my hubby made a rule that I have to wait for the day after Thanksgiving or the first snow, which ever comes first (he’s a party pooper like that). Where am I going with this? Well, this year I’m in my senior year of college, a full-time mom, homeschooling and blogging full time and somewhere in-between all of that I completely forgot about my Christmas cards. Too much stuff in my brain, and not paying enough attention to the calendar. Two weeks ago it hit me-Thanksgiving is next week. I don’t know why I didn’t realize it was so close, but it clicked in my head that Christmas is on its way, and I don’t even have my Christmas cards ordered yet. So I dragged the kids to the park with my camera, (which frankly is my fourth baby because I love it so much) took some quick photos the kids did not appreciate sitting still for, edited them fast, made the card and got them ordered. The other reason I love picture cards is because we send so many of them. Our family is huge, and it would be impossible for me to hand-write 40 long Christmas cards and get them out on time. This is one of those things that I consider “fast and done” to be better than “slow but never finished”. My favorite photo printer of all time is White House Custom Color. One of my jobs (I have a few: student, mom, cosmetologist, photographer, blogger, etc) is portrait photographer, and I always want my photos to look the same on my screen as they do on my client’s wall. With most printers, the photo comes out way darker than it did on the screen, but White House Custom Color does a phenomenal job at printing true-to-color photos. It’s one of those things that I happily pay more for higher quality than cheap but inferior prints. So getting back to “fast and done” means I use the Project Life App (which is free, yay!) who teamed up with White House Custom Color as their printer, to quickly create and order my Christmas cards. I whipped up the card on my phone in about 60 seconds using their free card templates (I used the Holiday 30 design), took another 2 minutes to place the order in the app and they showed up at my door in two weeks. 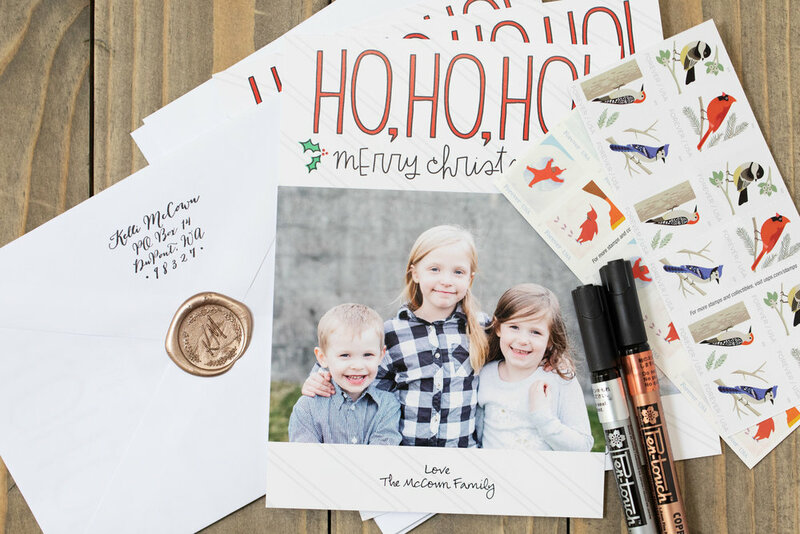 Seriously, creating a fast, high-quality Christmas card does not get easier than this. Here’s a quick (and I mean quick, it’s only a minute long) tutorial on how to create a card using the app. The cards come with envelopes, which makes this just a little bit easier and faster. I hate taking the time to write my address over and over, so I use the Calligraphy Address stamp from Ladd Designs. It would take forever for me to do 40 wax seals by hand, so I still use this glue gun from JetPens, and the Champagne Gold wax sticks from Back to Zero, which makes the process much faster. I also used the Bespoke Monogram Wax Seal from Stampitude. Stampitude makes some of my favorite wax seals, and I’ve been drooling over their new Christmas ones, the Merry Christmas, Pine Needle, Noel, and Mistletoe wax seals, which look amazing, and will some day be mine. 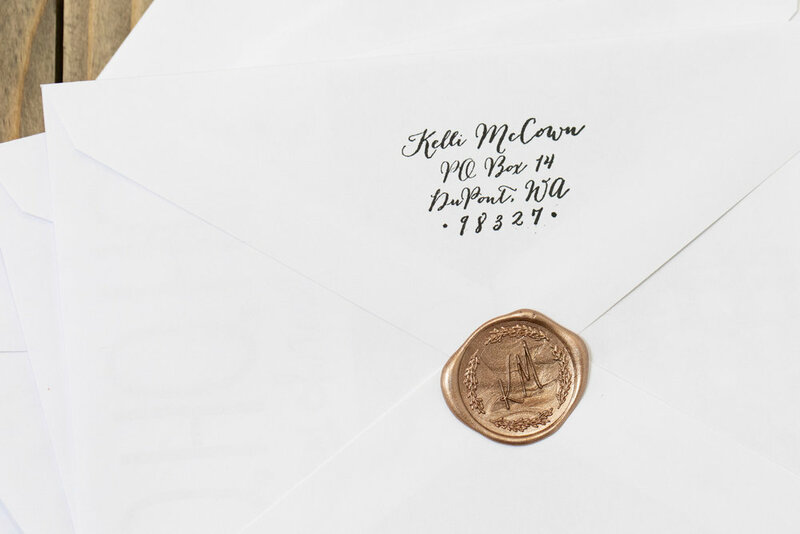 To address the card I tend to play it safe and use markers rather than pencils or fountain pens, which could smear if the envelope got wet, and who doesn’t love a metallic address anyway? I use the Sakura Pen-Touch 1.0mm markers in Copper, Silver, Gold and Black. While I don’t include notes in all 40 cards, I do include some hand written notes. For those, I use the Midori MD Cotton Letter Pad. When folded in half, it fits perfectly inside the Christmas card envelopes. I’m a bit obsessed with this letter pad right now, I’m pretty sure my pen pals are sick of it by now, but I still love it. The fountain pen varies with my mood, my favorite right now is still the Pelikan M605 White Transparent with a medium nib. I recently posted about inks for Christmas cards-Red and Green Inks and Silver and Gold inks. I ended up using Robert Oster Clay Red and Robert Oster Peppermint, which are the same ones I used last year. As mentioned above, when I get Christmas cards I stick them either on my fridge, or on the wall in my kitchen where I can see often. After Christmas is over and I’m ready to take them down, I take a quick photo of the card, and set the photo as the contact image for that person in my phone so it shows up whenever they call me. Well, if you read that whole thing, kudos to you for sticking with me to the end. How do you handle Christmas cards? Let me know in the comments below! Disclaimer: I purchased all items myself. All photos and opinions are my own. This post does not contain affiliate links and is not sponsored in any way.